This page is a “Table of Contents” for the series of articles that discuss aspects of trading system development. Here is a short menu with links directly to each article. Or, scroll down through a series of short introductions to the individual articles. To have confidence that the signals generated by the trading system precede trades that provide rewards adequate to compensate for the risk. The key word is confidence. The primary limitation is risk. The process we will use closely follows the scientific method. During development of a trading system we fit the model to the in-sample training data. Parameters are adjusted, each unique set of parameters defining an associated model. We are searching for the model that best fits the data. Best is defined by a formula — an objective function computed using the metrics associated with the trades, such as percent of trades that are winners, ratio of average win to average loss, maximum drawdown, etc. A trading savvy friend asked a pertinent question recently. She had some funds available and was considering three alternatives. She had tested them using good modeling and simulation technique and all three seemed safe. Safe in the sense that all three traded liquid issues and out-of-sample results were similar to in-sample backtests. The profit potential for the three were 20% per year, 10% per year, and 2% per year. She recognized that the one that offerred 2% was probably her “risk free” alternative. It would be the place to park funds when no other system needed them for an active position. It was not a future, and there were no options, so there was no leverage available to raise the annual return. Impulse signals are Buy and Sell signals that occur at the beginning and end of trades. 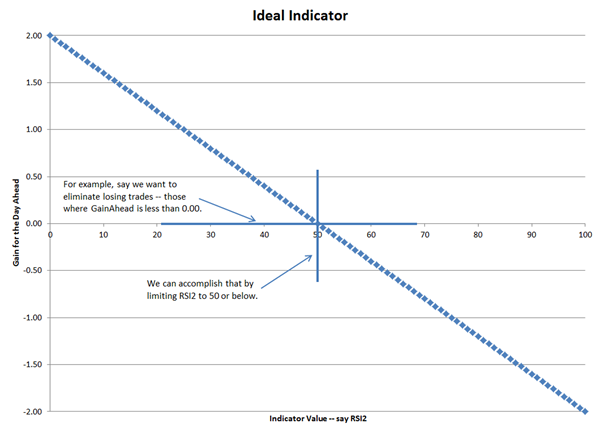 They often occur for a single bar, such as the bar where an indicator crosses a critical level, or when one of the trading rules is satisfied. Impulse signals are the default type of signal for most traditional trading system development platforms. State signals have a value for every bar. The signal tells the trader what the position should be for the next period. In a system that trades a single stock and alternates between long and flat positions, there are two states: I will refer to them as beLong and beFlat. State signals can be used with traditional platforms and are always used with machine learning.